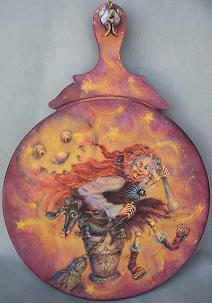 Baba Jaga" by Bobbie T.
This delightful painting is offered for sale today at $265.00. The cutting board is designed with a sculpted chicken head on the handle...as the story goes...Baba Jaga lived in a house with chicken feet and a chicken head above the front door! Shipping is an extra cost and will be arranged with Bobbie T. Arts, Inc.